I am a firm believer in starting my day off with coffee and a bite to eat. sweet, foamy milk into my cappuccino glass of gold-topped, strong, dark espresso sitting under the spout of my machine. I open the window, take out fruit and a croissant, and sit, sipping my cappuccino and taking it all in. Call it an art, a tradition, or even meditation exercise. My breakfast certainly isn’t continental; but it’s what I’m used to, and it’s what I love. If you walk into an Italian café in the morning, you won’t find eggs, bacon, or bagels. Italian cafes are more like pastry shops, offering cornetti (croissants), fruit tarts, and glass after glass of coffee. People flow in and out every day, standing at the bar counter, socializing, and sipping cappuccino after cappuccino. Service is fast and people leave satisfied. of being served in a café. confusing street layout of Poughkeepsie. This hunger drew me to Caffè Aurora, a historic remnant of the city’s “Little Italy”. conversing in Italian. It was a pleasant surprise for me, as I was instantly reminded of Florence. The words being spoken sparked my imagination as to what this “Little Italy” has meant for its people. 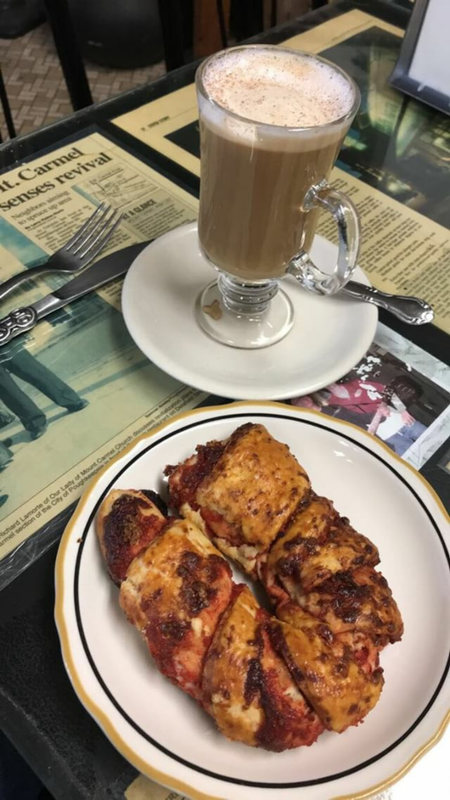 Once inside, I was greeted with a large array of empty tables and a full pastry case at the end, with cannoli, torte, taralli, and a plethora of breakfast pastries. I was surprised that there were no cornetti in the case. I ordered the closest thing, a raspberry horn, and with it, of course, a cappuccino. After ordering, I sat down and looked at my friend, who had driven me here. Months ago, we’d been sitting at Caffè Rosano on our last day in Florence. We’d frequented the caffè nearly every day for the past semester. The owner recognized us and our orders. Now we were here, in Poughkeepsie. We talked for a bit, watched as other customers passed in and out. The café’s walls, decorated with dolls, typewriters, sewing machines, baskets, and other memorabilia, spoke of a vibrant past. Newspaper cutouts embedded in the glass of the tabletops told stories that would otherwise be lost to legend. Our cappuccini and pastries were served to us in a matter of minutes, though in no rush. After learning to live life slowly for nine months in Italy, I had no reason to complain. My eyes fell on my cappuccino, served in a tall glass with a thin coating of foamed milk. Taking a bite of the pastry, the flakes of the horn slowly moistened and gave me a hint of raspberry as I chewed. I washed it down with the warm beverage, sipping carefully. its tradition; it is an artifact of Italian-Americans’ history and cuisine worth experiencing . Of course it isn’t the same as a café like Caffè Rosano in Florence, or anywhere else in Italy. It won’t be, and it doesn’t need to be. become. We can sip our cappuccini together, socialize, and take it all in. That, for sure, satisfies me.